Cid Sophiar is a Character in Final Fantasy XV. Outspoken old friend of Regis who owns and operates the Hammerhead garage. 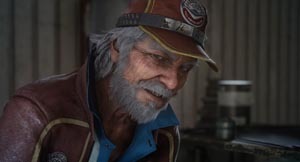 Although he’s getting on in years, Cid remains the master mechanic he was when he travelled alongside Regis thirty years before, and beneath the surly surface beats a warm and gentle heart.